Sacré Beurre! The End of the Croissant? August Zang, Austrian artillery officer, opened a Viennese Bakery in Paris in 1839. He introduced Viennese specialties such as the ‘kipfel’, which quickly developed into the croissant as we know it, named for its crescent shape. There are many different theories for the origins of the crescent shape, none confirmed by historical fact. One story tells that in 1683 a baker working late at night during the Ottoman Turks siege of Vienna heard the Turks tunneling under the walls of the city to attack the city from within. He warned the soldiers who destroyed the tunnel, saving the city. When the proud baker went back to work, he baked a crescent shaped pastry to represent the Austrians biting into the Turks Islamic emblem, the crescent moon. 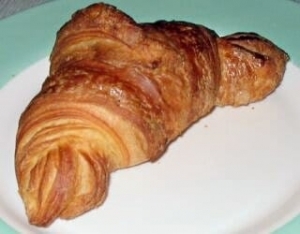 The End of the Croissant? Rising prices of butter, one of the main ingredients for a tasty croissant, mean that quality croissants are becoming more expensive to make and bakers are struggling to make a decent profit. The price of butter has gone from €2,500 a tonne last year to a massive €5,300 this year explained a baking industry spokesman.